Yesterday, the award ceremony of the first Boldbrain Challenge was held in Lugano. The first prize, a cheque worth 50,000 francs and other prizes in kind, went to the cleantech start-up i-Win. Boldbrain Challenge is a new accelerator program in Ticino organized jointly by Fondazione Agire and Centro Promozione Start-Up USI. Yesterday, the first edition was concluded with an award ceremony at the Aula Magna USI in Lugano. The event attracted 400 participants. 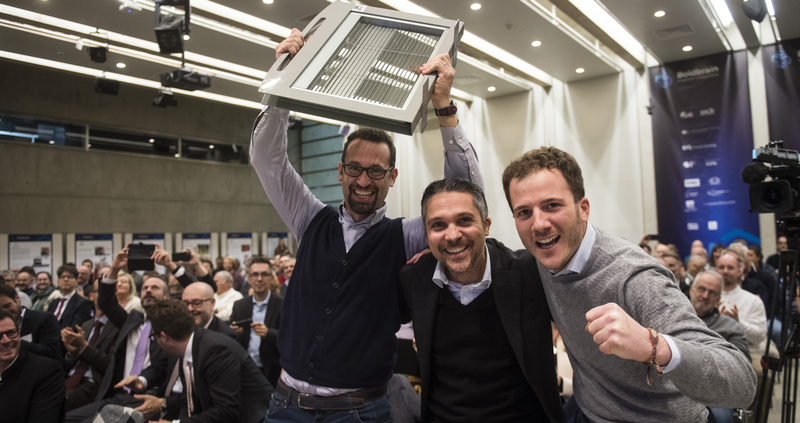 i-Win, which took first place, earning two prizes: a cheque worth 50,000 Swiss francs and a scholarship from the Executive MBA of USI worth 45,000 francs. In the last two years, the team has developed an innovative window solution to integrate flexible thin film photovoltaic cells into venitian blinds that are enclosed inside an insulating window. The solution protects buildings from overheating in summer and solar radiation, and at the same time, it produces renewable electricity. Although the start-up has not been incorporated yet, the team has already achieved the first important milestones regarding the marketing of the solution. The runner-up, I'm back, received a cheque for CHF30,000. The start-up developed a camera back enabling photographers to take digital pictures or videos with old analog cameras. The device is addressing amateur photographers who like high-quality mechanical devices and want to take pictures in a retro style. The third prize of CHF 20,000, went to TicInsect. The team developed a solution that uses food waste from local food processors to feed insects, from which TicInsect extracts protein and lipids to produce sustainable animal feed ingredients. Iridis (industrial vision for quality control) and Tell the Hotel (chatbot for hotels), ranked 4th and 5th, each received CHF10,000. In line with this, the top-ranked companies were also granted preferential access to the Swiss Economic Award and MassChallenge Switzerland, two programmes that support the development of more advanced start-ups. The Boldbrain Startup Challenge is a programme for innovative entrepreneurial ideas that will be repeated every year from August to December. Registrations for the 2019 edition will open in May. The rules and the process for registration will be visible on the website in the coming months.